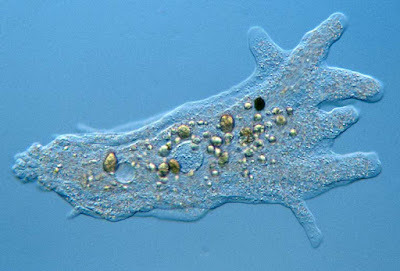 Amoeba proteus, copyright Wim van Egmond. The Tubulinea are a group of strictly amoeboid amoebozoans that are capable of producing tubular pseudopodia. See also: Amoeba: much weirder than you think; Tubulinea: the paragons of amoeboids. Characters (from Smirnov et al. 2005): Naked or testate amoebae producing tubular, subcylindrical pseudopodia or capable of altering locomotive form from flattened, expanded one to subcylindrical one. Monoaxial flow of cytoplasm in every pseudopodium or in entire cell. No cytoplasmic microtubule-organising centres; no flagellate stage in life cycle. [C-SCO04] Cavalier-Smith, T., E. E.-Y. Chao & B. Oates. 2004. Molecular phylogeny of Amoebozoa and the evolutionary significance of the unikont Phalansterium. European Journal of Protistology 40: 21–48. [SN05] Smirnov, A., E. Nassonova, C. Berney, J. Fahrni, I. Bolivar & J. Pawlowski. 2005. Molecular phylogeny and classification of the lobose amoebae. Protist 156: 129–142.